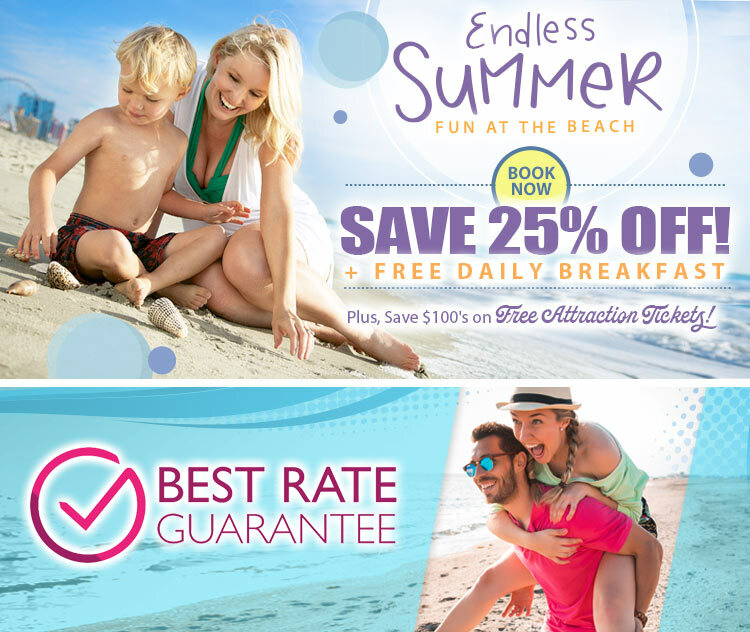 Save up to 30% OFF Spring and up to 35% OFF Summer + Free Daily Breakfast! The Strand Myrtle Beach by Condo-World is a boutique resort, with first class accommodations and oceanfront amenities that are quite impressive. This popular and highly rated resort features a beautiful oceanfront pool, a large kiddie pool, private cabanas, a swirling hot water whirlpool and a fully equipped exercise room. Best of all, FREE hot breakfast is included every morning! Spacious, convenient covered parking is also available. The Strand's unique design is comfortable, equipped with the amenities of home and packed with fun for the whole family. The Strand has partnered with DVDnow and local attractions to present the Sun & Fun Rewards. Just for choosing The Strand for your Myrtle Beach vacation, guests will enjoy unlimited DVD rentals, one complimentary daily admission to favorite local attractions and additional guest savings for free! I absolutely love this place. All of the guest service agents (day and evening) including housekeeping provide above superb services. Everything was exactly how I wanted it to be. Thank you for being a part of making my 50th birthday wish come true. Always professional, organized staff. Awesome beach view. Everything I needed was right here. Third time staying here! Coming back soon. We had room type C which is the standard size room (two double beds, sink and microwave) nothing too much for just an over night trip. Check in and out is always a breeze. Always nice staff and breakfast. The one and only con about this place is the parking. Since they share a structure with the hotel next door it can get kinda tight. and if you're not careful you can damage your car with the tight corners. We usually get room type G but it was sold out and plus for one night we didn't need much space. Atmosphere is always quiet and close to the strip. Their sister property Bay View is nice too. we've stayed there twice. The place was super nice and clean! Gorgeous views of the beach from 2 balconies. We stayed on the 7th floor and had no issues or complaints. The washer and dryer in our suite was a bonus and I am very happy to be flying home with a suitcase full of clean clothing. It’s depressing enough to have to go back home; let loan having to do laundry as soon as you get back! 😁. The breakfast was very good and was included with our booking as we booked directly with the hotel. If you do not book directly with the hotel there may be a charge for breakfast. Items included were bacon, eggs, potatoes, grits, waffles, biscuits, gravy, and fresh fruits among the typical continental breakfast items. The outdoor heated pool and hot tub were very relaxing and there was a plentiful supply of towels located by the pool. Pool towels are a bit small, so you may want to bring a larger beach towel or robe. Beds were super comfy and pillows were plentiful and perfect. The shower is a bit tricky with the double lever valve. Basically hold the lever part and twist the front valve. Water was good and hot once I figured out the hot & cold were backwards in the shower. Overall we really enjoyed our stay despite the cooler weather this week. Did I mention the free DVD’s to “rent”? I look forward to returning and staying again in the future. The wife and I took a last-minute getaway and chose The Strand. We were not disappointed. Clean rooms and a great staff. The first week of November and the weather was great. The Strand is right on the beach. We had an ocean view room. We really enjoyed the balcony. The area between the pool an beach was awesome. A grass area with lounge chair that were comfortable and shaded, for those times you wanted to relax, but not be in the sun but lay back and listen and watch the ocean. I was very happy with our accommodations, and having a kitchen and washer and dryer a great extra plus. Friendly staff, clean rooms, great ocean views. The bedding and pillows were comfortable and the room was equipped with everything the traveler needs. The entire staff was very friendly and upbeat! and concerned about our well being. Great place to stay!!! Definitely will return :) The heated pool was very relaxing also. I had a neighbor travel with me (a little older and had a cane) and everyone was so helpful even when she indicated she wanted to get in the heated pool two gentlemen walked over and immediately began to help me get her down in the pool. Also, o of the gentleman actually waited until we were able to spend time in the pool and assisted me in getting her back out of the pool. Again, all the way from housekeeping to the front desk we were greeted with smiles, support, and superior customer service. Every aspect of our stay was excellent! We were immediately made to feel comfortable and that our needs if there were any would be met quickly. All staff were kind especially the wonderful woman who was in the breakfast area. She was so kind and efficient. Also the concierge and front desk staff when we checked in were awesome! The place was clean and had friendly service. We stayed in a 2-bedroom condo oceanfront and was able to see the sunrise without leaving the room. I normally do not make comments but it was a nice vacation and the breakfast made it a plus. Excellent service for breakfast ... I would visit again. Everything about this hotel and the staff was absolutely wonderful. We were comfortable and it was private. The beds were amazing. The suite was absolutely beautiful with a beautiful view of the ocean. The breakfast is good although a bit crowded at times. Excellent hotel and parking. Would recommend to friends. My wife loved the bed, but I found it too soft for my taste. The morning breakfast was exceptional and the variety of foods and beverages was very pleasing. We stayed here for a weekend volleyball tournament and were very pleased. Extremely clean and the staff was super friendly and helpful. Off season rates are so reasonable. Would definitely stay again if we are in Myrtle Beach. The Strand is a our #1 choice when staying at Myrtle Beach. We love the location, the boutique vibe, the new furnishings, and the willingness of the staff to make our stay enjoyable. Our favorite part is the ability to use the outdoor pool and massive whirlpool all year long, even in the dead of winter. It was a nice stay. Room & bed were comfortable. Nice view of the ocean. Free breakfast & hostess were great. We enjoyed our stay. Kid friendly. Quiet at night. Small refrigerator & bar sink. Friendly employees. We'll never stay anywhere else in MB! We celebrated our 10th anniversary here by renewing our vows, and had such a fabulous stay that before we left we booked a room for our next vacation. It's a great location, our room was clean and spacious (with a washer/dryer in it), the staff is so friendly and helpful, and the complimentary buffet style breakfast (bacon/sausage, eggs, potatoes, biscuits, grits, yogurt, fruit, waffles, pancakes +++) was superb! Originally, it was the layout of the 'Oceanfront King D Suite' that made us choose The Strand over the other hotels, but it's the many other wonderful things about this place that will keep us coming back! Great resort!! Awesome view of ocean from room and pool. From the front desk staff to the housekeeping staff, everyone was professional, helpful and friendly. Marlene and Samitrius at the front desk are wonderful, and Laura at the bar was so kind and friendly!! Would highly recommend this resort for your next MB stay!! This is our fourth or fifth time here. We love this hotel. The staff is welcoming, the grounds are well cared for, and they have the best (included!) hot breakfast around. There are several types of rooms, so there's bound to be one that fits your style and budget. We've stayed in all of them; the smaller ones might be cramped if you have kids. But the larger ones are sure to fit your family! With heated pools, a huge hot tub, and free DVD rental, you're going to love it here. By now, it feels like a second home for us; in fact, the manager recognized us when we walked in. It was tough to leave, but we will be back soon. They even offer monthly rentals! We love this hotel so much! Everything is very clean and well maintained. Staff is very kind and friendly. Bar had great drinks and food. We plan to stay here every time we visit Myrtle Beach. There was an issue with our reservation and they upgraded our room free of charge to make it up to us. That’s the things that guests remember! Ultimate vacation spot. Wonderful staff unbelievable breakfast and the best view on the beach. Great surf fishing and not far from all the stores but still very quiet. Music by the pool was just what the doctor ordered. Heated pool and also hot tub. Everything you could ask for. Wonderful hotel, the truth is I wasn’t sure what to expect because the rates seemed low to me so I booked the biggest room they had and hoped for the best ! Wow was I surprised, great location, beautiful room very clean , free parking, free internet and free breakfast ( eggs, bacon etc .... ) The staff was really friendly too!